I’ve been a flickr user since October 2004. I actually didn’t like them that much then because it takes too long to load (it was mostly flash-based then), and it doesn’t work well with Opera. Of course, back then I’m on a crappy dial-up service, so loading the site is just torture. Eventually I warmed up to it. Getting tired of setting up and maintaining my photo gallery in my domain, I moved all my photos to flickr. I’ve been a happy flickr user ever since. Last night made me an even happier flickr user. 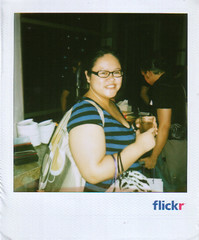 See, the flickr team came to Manila, as part of their world tour, following their recent international launch. Together with fellow Pinkists, we flocked to M Cafe where the event was held. We took in the flickr-ness of it all: the pink and blue balloons and beach balls, the pink and blue drinks (lychee martinis & blue martinis), flickr pins, buttons and even the first flickr book and PRO accounts! Of course, what would a flickr meet be without pictures? But all in all, it was a great end to a week of social networking. I will go back living under a rock come Monday. P.S. To see pictures of the 24 hours of flickr in Manila party, head on to flickr and search for photos tagged with “flickr24manila.” Or click on that link. Next in the 24 hours of flickr circuit are Kuala Lumpur on August 28, and Hong Kong in August 30.
aiyeeee.. thanks for reminding me! the KL flickr event is just tomorrow! And they are giving away PRO accounts??? Cayce: Yay! Post your pictures, okay?